Design and construction in existing contexts is becoming increasingly important, and often the structures - sometimes of historical interest - can be preserved easily and at minimum cost by employing strengthening measures. Existing concrete members can be strengthened by using adhesives to bond additional reinforcing elements onto or into those members. This book explains the design rules, together with their background, and uses examples to illustrate their use, specifically for slabs, beams and columns. Concrete member strengthening measures can take the form of, for example, flexural strengthening with externally bonded (surface-mounted) CFRP strips, CF sheets and steel plates, flexural strengthening with CFRP strips bonded in slits (near-surface-mounted reinforcement), shear strengthening with externally bonded CF sheets and steel plates, and column strengthening with CF sheets as confining reinforcement. 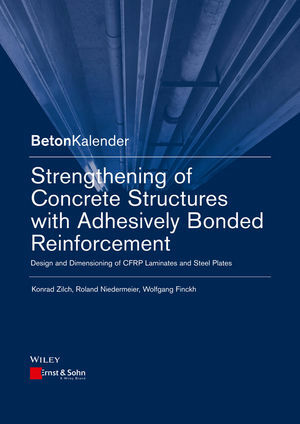 The explanations and background information provided are mainly based on the new German guideline "Strengthening of Concrete Members with Adhesively Bonded Reinforcement" by the German Committee for Structural Concrete (DAfStb). This is the first European guideline to regulate this topic in the form of a supplement to the Eurocode. As it is planned to produce a document in a future Eurocode 2, the DAfStb guideline serves as a starting point. The authors are extensively involved in the planning, design, operation and inspection of buildings for preservation and reconstruction, and in the updating of European Technical Approval Guidelines (ETAGs) and design rules. Prof. em. Dr.-Ing. habil. Dr.-Ing. E. h. Konrad Zilch studied civil engineering and gained his doctorate at TU Darmstadt in 1976. Following research posts at the University of California, Berkley, and the University of Western Ontario, Canada, he worked in the construction industry for many years. From 1988 to 1993 he was professor for structural analysis at RWTH Aachen University, and from 1993 to 2009 professor for concrete structures at TU Munich. PD Dr.-Ing. habil. Roland Niedermeier studied civil engineering and gained his doctorate at TU Munich in 2001. Since 1993 he has been involved in research at TU Munich and MPA BAU, the accredited authority for testing construction materials and products, where he has been the head of the Structural Engineering Laboratory since 2001. Dr.-Ing. Wolfgang Finckh studied civil engineering and gained his doctorate at TU Munich in 2012. He has been a chief design engineer at Wayss & Freytag Ingenieurbau AG (w&f) since 2012.